2 BR Condo on secluded Ocean Beach and Golf Resort at Estrella del Mar, Mazatlán Mexico. This spacious 1400 square foot condominium is completely furnished. The master suite includes a king bed and private bathroom, and offers direct access to the terrace and panoramic views. The guest suite includes two twin beds and its own bathroom. Communicating is easy via the unit's wireless Internet access. All you need to bring are lounging clothes, bathing suits, and golf clubs. Easily accessible on the second level via stairs or elevator, this ocean front condo has great views and is protected from the cool northwest ocean breezes that prevail at sunset. Start or end each day with a walk along the pristine beach, just steps from the unit. Unlike many other ocean-front resorts there are no vendors hawking their goods on this practically private beach. For golfers, the beautifully manicured and maintained Estrella del Mar golf course, architected by Robert Trent Jones Jr., is located directly behind the unit. A private pool stretching for more than 80 yards and a hot tub lie in the common area directly below the unit. Two restaurants on-site are open seven days a week and a convenience store stocks snacks, soda, and other handy items. The entire staff at Estrella del Mar is extremely friendly and helpful. All speak English but are willing to assist you learn the basics of Spanish if you prefer. Estrella del Mar is located 10 minutes from the Mazatlan airport via taxi, rental car, or resort shuttle. Transportation to and from Mazatlan is available, so shops, restaurants, and historic sites are within reach. The shuttle and taxi services make travel convenient without a rented car. The three ownership couples -- Joe and Michelle Bilotta, Mike and Sandi Hetrick (pictured), and Erik and Lisa Runstrom -- all live in Fort Collins, Colorado. We manage the rentals ourselves and rent to trusted individuals and families who we feel would treat the condominium as their own. We have owned this unit since it was built. We all witnessed the actual construction and knew at that time that this was going to be a place for us to enjoy. It holds a definite allure in the region's natural beauty and in the warmth of the Mexican people both at the resort and throughout Mazatlan. Just about everyone with a condo to rent as Estrella del Mar has a terrific (and true!) story to tell about their unit. We are situated in a beautiful part of the country. Our unit is in top condition and we keep it that way through constant upgrades. Most recently we've added a new king bed, living room sofa, kitchen cook ware, and towels among other improvements. It's a comfortable place to call home for a few days or longer. Our unit is on the second floor. Windows and patio doors can be left open day and night without security concerns. It is situated on the north side of the Phase 2 complex, overlooking the Pacific Ocean to the southwest. This means our balcony is protected from afternoon sun and cool winds that blow off the ocean toward sunset. I come to EDM every year. As an owner I always have a relaxing stay at our condominium. This was our fourth visit, so we must like it. There are some minor imperfections, like the patio furniture and no BBQ, but the condo is very comfortable. The shopping is 20 minutes away. The taxis charge around $28 US each way. Car rental for the day varies between $30 to $60. The rental agency picks their customers up and drops them off. We tip about $3 each way. The golf course is good and not very busy. 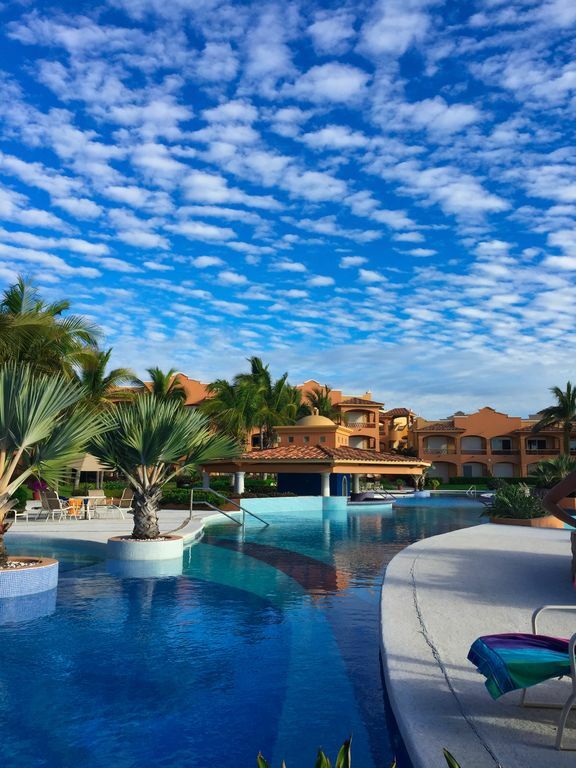 We stayed a week at Estrella del Mar, and we couldn't have chosen a better condo. The location was absolutely perfect - from the balcony we overlooked the pool, the beach and saw many beautiful sunsets. The property is beautiful, the food at the restaurants is amazing, and the amenities are to die for. We will definitely return and hopefully we can stay much longer! Thank you for sharing your wonderful home. Right on the beach with a view of the ocean and the the beautiful pool, this condo would cost a couple million dollars if it were in the US. We loved the fact that even for Christmas week, the development was not too busy and the pool was not crowded and noisy. The weather in Mazatlan was perfect in December. The condo is heaven for golf players who can roll out of bed and hit the links. For us, the location of Estrella Del Mar (EDM) was too far from Mazatlan. Going to one of the main grocery stores (Walmart or Mega) took about an hour RT drive because of the distance, and the traffic and lights once you get to town. This also meant that going out to dinner in the evening became a serious commitment because of the long drive back after dinner. Unfortunately the restaurants right at EDM were no great shakes, but at least they are convenient. A car is absolutely necessary at this rental. We would suggest that the owners make a bit of an investment in the condo. The mattress in the main bedroom is a Full size, and it has a hollow in the middle, which caused my back to hurt by the end of the week. There is no TV in the main bedroom. In the second room there are twin beds and the mattresses seemed fine. There is a TV in that room, but it does not work. There are many little things that need addressing. For example the kitchen lacks some basic things (e.g. no salad bowl, broken cork screw), the chairs on the balcony are cheap white plastic, and things like bath mats need replacing. My impression is that it had been a while since the owners were there, and there is probably not much feedback or input from the property manager. The cleaning lady also needs greater encouragement as we found sand under small throw rugs. The owner that I communicated with was helpful and responsive in terms of booking and information. We just got back from a very relaxing stay at this wonderfully appointed condo on the beautiful beach of Estrella del Mar. The condo has everything you need - an AMAZING view, a great kitchen, nice layout, and little touches such as Mexican art, Wifi and nice bed linens. The owners were fantastic to work with and very helpful. Estrella del Mar is located on (in our opinion) the most beautiful beach in Mazatlan. It is a quiet, friendly and well run property with a great golf course and a couple of restaurants on site. The owners can even arrange for someone to grocery shop for you so that everything is there for you when you arrive. It was also nice to know that Estrella del Mar has their own water filtration system so that the tap water is safe to drink. Our kids especially loved boogie boarding, hanging out in one of the many pools and visiting the turtles. We loved the beauty and tranquility of the property. Thank you Mike for everything!